It’s been almost two months from my last pizza recipe and I still wonder how I managed to survive all this time without one of my favorite dishes. Now, pizza and sandwiches are my favorite foods but my wife loves a good flatbread too, so she never complains when I get creative and make some, especially when it turns out to be something out of this world. Granted I don’t always put fruits on my pizza, I am more of a bacon type but every once in a while I like to try something new. Keep in mind that I have 25 pizza recipes on my blog so you know I am a fan by now. With this pizza, I got the idea from our local pub when my wife and I dined there one time. I ordered a manly dish, of course (a steak or something, I don’t remember) but my wife got this thin crust pizza with peaches on it and she really loved it, though kinda too sweet for my taste but I liked it too. Weeks later, I totally forgot about the whole experience until couple of days when trying to come up with some dish that my wife might enjoy, I remembered about this pizza and I started making it from memory. 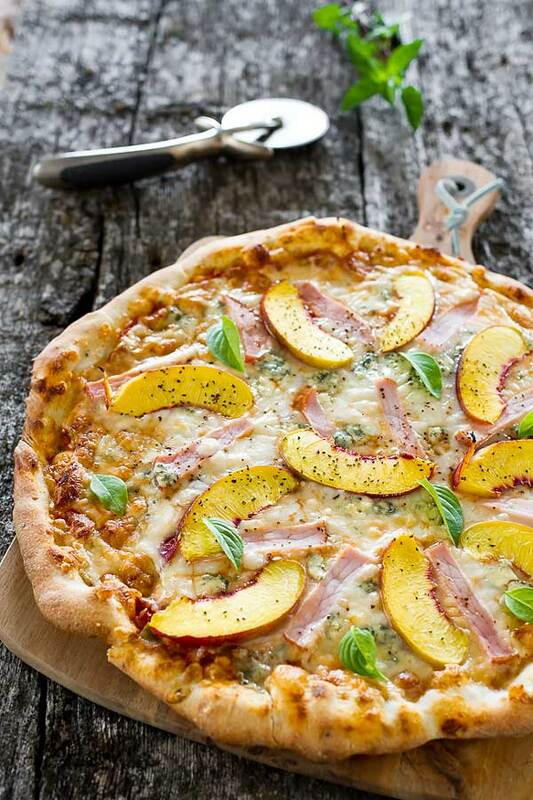 Turned out to be a wonderful combination of Gorgonzola and peaches but I have to admit, I added a generous amount of Canadian back bacon as well, my way of sneaking pork onto a girly frufru pizza. Add a bit of basil on top of everything and you might even get lucky that evening. So men, I’m assuming there are some men reading this blog, if you want to surprise your woman try this pizza here, you’ve got pork for you, basil and peaches for her and cheese that will work for both of you. I think of it all, don’t I? Does anybody appreciate me? Is anybody out there? Hello? Roll out the dough and place it on a pizza tray. Brush with 1 tsp extra virgin olive oil and top evenly with shredded mozzarella cheese then Canadian bacon, Gorgonzola and peach slices..
Bake for 10 minutes or until the crust goes brown. There is also the option of baking it for 5 minutes without the peach slices and then add those in the last 5 minutes of baking but is a matter of choice, I really loved mine roasted. Season with loads of pepper and add few basil leaves. You can also sprinkle some balsamic reduction or you can serve it the way it is. Since I am a dude, I used some Frank's Red Hot Sauce here and there and it was amazing. I’ve never tried putting fruit on my pizza.. (except for tomatoes) and definitely need to try the peach addition – I bet it goes perfectly with bacon! OMG you don’t know what you’re missing. Check out my other pizza recipe with pineapple, it’s a classic.